Thanks so much to Andy for doing this! 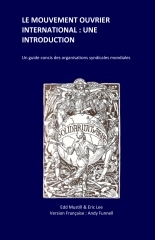 Le Mouvement Ouvrier International : Une Introduction – Un guide concis des organisations syndicales mondiales is now available for purchase from CreateSpace, Amazon, etc. Not yet available at Amazon.fr but should be there in a few hours (price 4,69 €).